Could Barrier Protected Bike Lane Have Prevented Collision Between Motor Vehicles? Earlier this year I read about a verdict in a Cook County injury case that got me thinking about bike lanes. Interestingly, the case did not involve a bicycle at all. 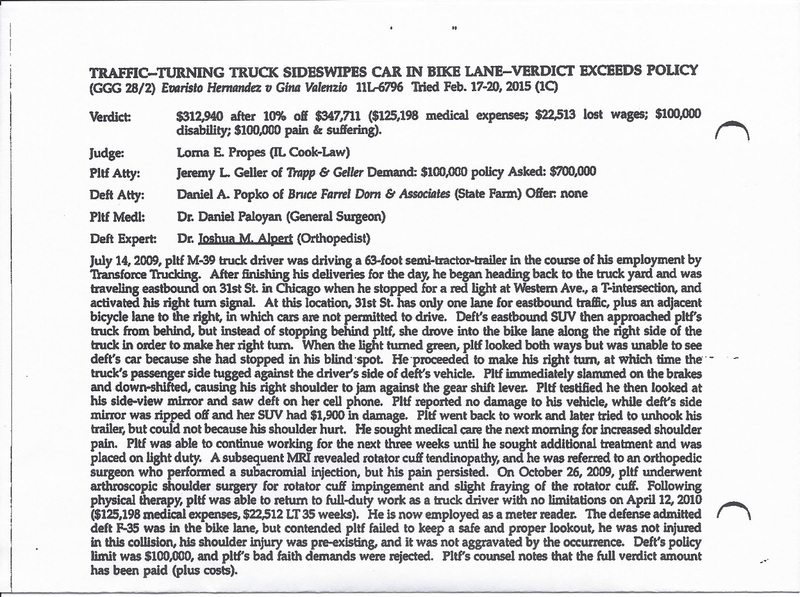 The case, Hernandez v. Valenzio, which our firm had nothing to do with, involved two drivers. The injured driver, the plaintiff, was stopped in a 63 foot semi tractor trailer at a red light on 31st Street waiting to turn right at the intersection with Western Avenue in Chicago. As he did, the defendant, pulled up next to him in her SUV in a bike lane immediately to his right. According to the Cook County Jury Verdict Reporter, “When the light turned green, plaintiff looked both ways but was unable to see defendant’s car because she had stopped in his blind spot. He proceeded to make his right turn, at which time the truck’s passenger side tugged against the driver’s side of defendant’s vehicle.” The truck driver then slammed on his brakes which caused him to be thrown forward, injuring himself. He again looked in his side view mirror and saw the defendant driver talking on her cell phone. At trial, the truck driver won his case receiving a substantial verdict. This result came despite defendant’s allegation that the truck driver was the one primarily at fault for failing to keep a “safe and proper lookout” for vehicles to his right. A few things came to mind when I read this. First, I was heartened by the jury’s recognition that motor vehicles do not belong in bike lanes. I am guessing that they also did not like that the defendant was seen on her cell phone at the time of the crash. These are very positive takeaways from a trial in which the plaintiff’s attorneys, Trapp & Geller, clearly did a very good job of making sure the jury understood the rules of the road. However, as I thought longer about the case I became concerned about the truck driver’s conduct as well. What if there had been a person on a bike in the bike lane rather than a SUV? If he did not see a SUV, surely he would not have been a bicycle. This could have lead to disastrous consequences. There can be no doubt that the truck driver had a duty, as any motorist would, to look for bicycle traffic before executing a right turn across a bike lane. Did the jury also wonder about such a hypothetical situation? Would they have held the trucker responsible had he injured a cyclist? It is impossible to know, of course. However, it seems to me that there is something that could have prevented this incident, and my hypothetical situation, entirely: A real protected bicycle lane. On the date of the crash, July 14, 2009, the bike lane in which the defendant driver stopped consisted only of white lines on the roadway. While white paint certainly creates legal separation, obviously it is no barrier to a driver unconcerned about the law or the safety of others. Recently, the first concrete, curb protected bicycle lane was installed in Chicago, on Sacramento through Douglas Park. Hopefully, more are on the way. Bike lanes protected by concrete barriers would resolve a lot of the problems that crop up over and over again for cyclists who use bike lanes. They would prevent taxi cabs for using bike lanes to load and unload passengers. They would prevent drivers from using bike lanes as parking spaces. They would prevent — or at least strongly discourage — reckless motorists from dangerously veering into lanes designated for bike traffic. Had a barrier existed at 31st and Western back in 2009 it is unlikely that the defendant would have pulled to the right next to the semi tractor trailer. A barrier of sufficient size may also prevent the type of collision that killed Chicago bicyclist Barbara Eno who was killed by a right turning truck driver in 2014. Originally posted at Could Barrier Protected Bike Lane Have Prevented Collision Between Motor Vehicles?